If you’ve ever marvelled at Heston Blumenthal trying to recreate the battered fish and chips of his childhood, or travelling to Italy to research ingredients to make the best pizza around on TV show In Search of Perfection you’ll appreciate his tendency - make that obsession – with recreating the flavour of something exactly as he remembers or perceives it to be proper. 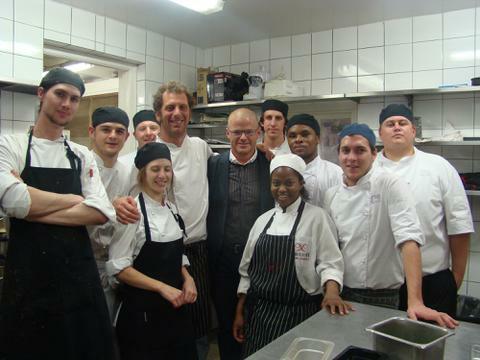 Turns out the celebrated chef was in Cape Town this week and dined at La Colombe on Tuesday May 25th. He met chef Luke Dale-Roberts at the chef pow-wows surrounding The San Pellegrino World’s 50 Best Restaurants of the World awards. Blumenthal’s restaurant The Fat Duck moved down a spot to third place in 2010. La Colombe jumped 26 places to 12th best in the world. Notably, La Colombe was the only southern Hemisphere restaurant to feature in the top 20, ahead of Australian restaurants Quay (no. 27) and Tetsuya’s (no. 38) in Sydney. I dined at both in Sydney a few years back, telling examples of where Australian cuisine was pegged (at Quay I marveled at micro-herbs and custom-grown leeks for the first time). La Colombe’s achievement is significant, considering that Australia has always powered ahead of South Africa in terms of menu innovation, general caliber or chefs, and fresh ingredient sourcing – I was impressed when Forty One chef Dietmar Sawyere told me Sydney chefs could land a fish on a diner’s plate within six hours of catching it. In South Africa, not a chance then or now. Back to Heston Blumenthal. I interviewed him at his London restaurant on September 11th, 2001 for a South African food magazine. That isn’t a day any of us forget. With breakfast hours before, I was famished after being stuck in a narrow L-shaped kitchen observing and tasting egg and bacon ice cream and other exotic desserts during lunch service. Close to three hours with Blumenthal followed as he explained his food philosophy in his office. I left The Fat Duck hungry but fascinated at the mind of a man who pushes himself zealously and truly wants to self-educate and improve. One of his defining food moments was going to a Michelin-starred restaurant at age 15 or 16 while on holiday in France with his family “who weren’t foodies”. They may have been lukewarm about the meal but he was “completely blown away” after experiencing his first soufflé where a hole was made with a spoon and sauce was poured inside. Blumenthal decided then that cooking was the career for him. At age 17 before making his debut in a kitchen, Blumenthal sold photocopiers and learnt how to run a business by working for a corporate debt collector. He experimented in the kitchen during his spare time. Using books, he taught himself kitchen techniques from classical butchery to sauce making. He met his wife at 19 and made her “the poor guinea pig” of his culinary experiments. He once woke her at 2am and asked her to test three different chocolate tart mixtures. Similar Blumenthal investigations would explore say, crème brulee. Different puddings made with skim milk, UHT milk, full cream and crème fraiche. Or this creamy dessert created with different sugar types, different quantities of egg, or cooked in a Bain Marie or without. As he put it, he had “a completely obsessive drive, a thirst for knowledge”. In the early days the young couple went to France on holiday annually. They’d work and save for months in England without going out to afford the trip. Once in France they’d blow it all on wine producers, Michelin-starred restaurants and cookbooks. Many South Africans are unaware that The Fat Duck may never have happened. In 92 or 93, the Blumenthals bought a house in England. Heston was looking for a restaurant venue and his sister, living in South Africa, pointed out that South Africa would be a cheaper option. He seriously considered buying what is today Mont Rochelle Hotel in Franschhoek. But his growing interest in the scientific side of food meant the distance from London and Europe’s food scientists, and the lack of imported products were major drawbacks. Instead Blumenthal found a restaurant site in Bray outside London.